And we’re back! This update took longer than I suspected for many reasons. Some of them personal, some of them ironing out a few continuity issues, but luckily none of them trying to figure out if it was winter and where Peter Parker was working! It’s a big update consisting of over 90 issues as we make our way through most of 1981-1982. First some housekeeping. I’ve inserted the Spider-Man story from Marvel Team-Up #126 just before the end of the last update. It’s actually a reprint from a newspaper Sunday supplement that could really fit in most places as long as Peter is working for the Daily Bugle. Some chronologies have it a bit earlier than this, but that conflicts with Peter working at the Daily Globe. As you may have seen in my other column series, I’ve excluded Marvel Super Hero Contest of Champions and The Death of Captain Marvel from this list since Spidey really only has glorified cameos in both. If you want to read them (and I would recommend Captain Marvel) they can pretty much go anywhere around this time period. Also, Marvel Team-Up 104-105 do not feature Spider-Man. Spectacular Spider-Man 049 [Story 1] – After Amazing Spider-Man 210. Aunt May gets engaged to Nathan Lubensky. Spectacular Spider-Man 050 [Story 1] – Immediately after Spectacular Spider-Man 49. Spectacular Spider-Man 051 [Story 1] – Continues from Spectacular Spider-Man 50. Amazing Spider-Man 212 – 14 hours 23 minutes and 8 seconds after Amazing Spider-Man 211. Peter starts working again at the Daily Bugle. Spectacular Spider-Man 049 [Story 2] – The White Tiger back-up stories in Spectacular Spider-Man 49-51 do not feature Spidey, but lead to the conclusion in the full issue of Spectacular Spider-Man 52. Spectacular Spider-Man Annual 02 – Peter working at the Bugle again. Working with Ned Leeds…guess the whole Betty thing is behind them. Amazing Spider-Man 213 – November. Peter’s apartment catches fire. Amazing Spider-Man 214 – Immediately after Amazing Spider-Man 213. Amazing Spider-Man 215 – Immediately after Amazing Spider-Man 214. Amazing Spider-Man 217 – Continues from Amazing Spider-Man 216. Amazing Spider-Man 218 [P1-P9] – Immediately after Amazing Spider-Man 217. 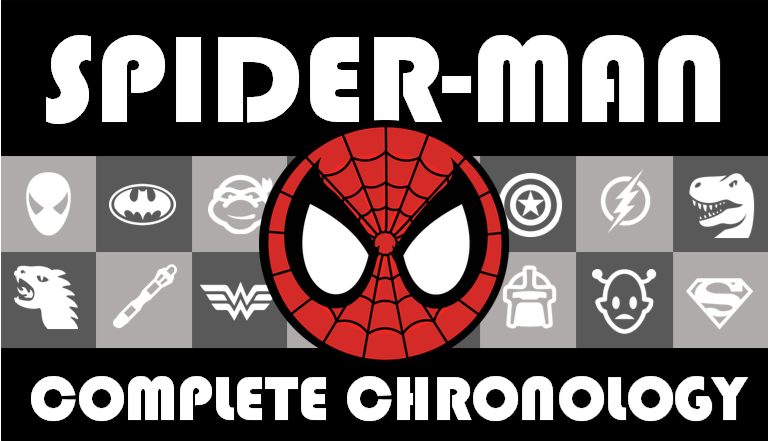 There are several week long breaks in the story and direct references to Spectacular Spider-Man 56 and Marvel Team-Up 107. And to be specific, the split occurs after Page 9 panel 5. Spectacular Spider-Man 054 – Direct reference to Amazing Spider-Man 216. Spectacular Spider-Man 055 – Direct reference to Amazing Spider-Man 214-216. Amazing Spider-Man 218 [P10-P22] – To be specific, we pick back up on Page 9 panel 6. Spectacular Spider-Man 057 – Peter says he has a new camera. He had a camera destroyed in Amazing Spider-Man 219. There is no reference to them being related, but ordering them this way so that it flows smoothly. Marvel Team-Up 109 – Immediately after Marvel Team-Up 108. Spectacular Spider-Man 059 – Direct reference to Amazing Spider-Man 221 and a note that it occurs between Spectacular Spider-Man 58 and 59. Spectacular Spider-Man 060 – Story 1 – Immediately after Spectacular Spider-Man 59. Direct reference to Marvel Team-Up 108. Story 2 is a retelling of Spidey’s origin with additional material including Uncle Ben’s funeral. Thought about moving it near the beginning of the chronology, but really no reason to. The intro also starts by talking about Peter as a grad student, so treat it as a true flashback. Marvel Team-Up 111 – Issue contains a letter from new editor Tom DeFalco that Amazing Spider-Man, Spectacular Spider-Man, Marvel Team-Up and Marvel Tales are now all under his watch. Marvel Team-Up 112 – Continues from Marvel Team-Up 111. Amazing Spider-Man Annual 1981 (#15) – Looks like Jimmy Olsen is on special assignment at the Daily Bugle. Marvel Team-Up 113 – Direct references to Amazing Spider-Man 224 and Spectacular Spider-Man 55 and 62. Spectacular Spider-Man 063 – First mention of Liz Allen and Harry Osborn being married. Peter and Flash never attended the wedding (and Peter didn’t even know they were married). Spectacular Spider-Man 124 – This is an “untold tale” issue that takes place around this time period but is a pain to place accurately. It all depends on what potential continuity error you wish to ignore. Peter is still a teaching assistant which he quits in Spectacular Spider-Man 68. Direct reference to Amazing Spider-Man Annual 15, so has to be after that and before Spectacular Spider-Man 73 when Spidey and Doc next fight. Some chronologies place this after Spectacular Spider-Man 72 when Ock escapes from prison (there since Amazing Spider-Man Annual 15 one would assume) but never encounters Spidey. In terms of Ock, that seems to work. But since our subject is Peter Parker, I find being consistent with his TA job to take precedence. It makes more sense to me for the TA timeline to remain intact since Ock could escape prison and be recaptured at any point during this timeframe and possibly in a non-Spidey related title. Amazing Spider-Man 226 – Direct reference to Marvel Team-Up 114. Marvel Team-Up 116 – Story continues from Marvel Team-Up 115, but not immediately. Direct reference to Amazing Spider-Man 227. Direct reference to Defenders 68, which seems to be a typo and should be 61. Spectacular Spider-Man 065 – Direct reference to Amazing Spider-Man 209. Captain America 266 – Immediately after Captain America 265. Spectacular Spider-Man 067 – Spectacular Spider-Man 66 was “last night”. Peter promises to take May to Ben’s grave “tomorrow”, which happens in Spectacular Spider-Man 68. Spectacular Spider-Man 068 – Deb references Spectacular Spider-Man 67 as being yesterday. Peter quits his teaching assistant job. Deb believes she’s discovered Peter is Spider-Man. Amazing Spider-Man 230 – Immediately after Amazing Spider-Man 229. The Defenders v1 107 – Direct reference to Marvel Team-Up 116. The Defenders v1 108 – Immediately after Defenders 107. Direct reference to Marvel Team-Up 117…which is a typo and should be Marvel Team-Up 116. The Defenders v1 109 – Immediately after Defenders 108. Direct reference to Marvel Team-Up 112. Direct reference to Marvel Team-Up 119, which happens immediately after this issue. Marvel Team-Up 119 – Direct reference to and immediately after Defenders 109. Direct reference to Spectacular Spider-Man 68. Marvel Team-Up 117 – The timeline with respect to villain Professor Power gets a little quirky here and Marvel Team-Up 117-118 appear to take place after the Defenders issues and Marvel Team-Up 119. Marvel Team-Up 118 – Continues from Marvel Team-Up 117 which took place “yesterday”. Spectacular Spider-Man 070 – Immediately after Spectacular Spider-Man 69. Marvel Team-Up 121 – Direct reference to Amazing Spider-Man 222. Amazing Spider-Man 231 – Direct reference to Spectacular Spider-Man 68. After Peter has quit as teaching assistant and Debra suspects he’s Spider-Man. Amazing Spider-Man 232 – Immediately after Amazing Spider-Man 231. Direct reference to Spectacular Spider-Man 68. Marvel Team-Up 123 – Continues from Marvel Team-Up 122. Direct reference to Spidey’s ankle still being sore from Amazing Spider-Man 232. Amazing Spider-Man 235 – Immediately after Amazing Spider-Man 234. There is a direct reference to Marvel Team-Up 124 which can be confusing. It is with regards to Aunt May moving out of her nursing home and back to the Parker residence which occurs in that issue. I read the reference in this book as saying that “will” happen, not “has” happened, hence I have Marvel Team-Up 124 after this issue. Amazing Spider-Man 236 – Immediately after Amazing Spider-Man 235. Marvel Team-Up 124 – Direct reference to Marvel Team-Up 118. Aunt May moves out of retirement home and back to Parker homestead. Marvel Team-Up Annual 05 – Direct reference to Marvel Team-Up 111. Spectacular Spider-Man 073 – Direct reference to Amazing Spider-Man 233. Previous Previous post: Trailer Time: Warcraft Again? !